Natural gas supply and demand fundamentals have changed in a major way. In March there was way too much gas. By November there may not be enough…at least at these low prices. NOW is the time to position yourself to profit from it…..BEFORE the money starts flowing into natural gas producers. For 21 consecutive weeks natural gas inventories have risen by less than what we would expect in a normal summer and fall. Every week…less and less gas for months…and once there was Big Heat in August and September…North Americva used a lot more natgas than anyone thought we would. 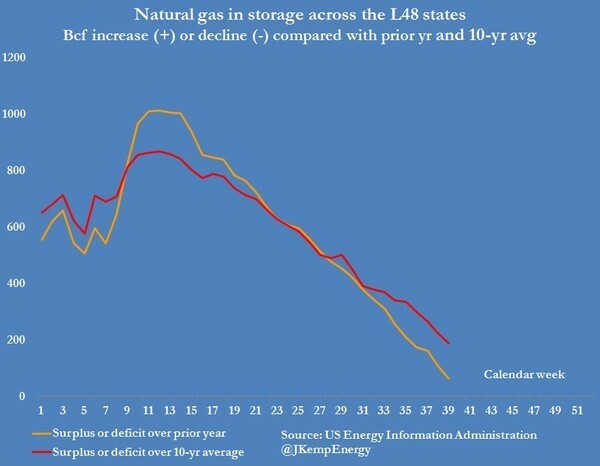 The result of this: the enormous natural gas storage surplus is vanishing–quickly. The chart below shows how the surplus over last year is plummeting. Back in March we had a huge amount of natural gas in storage. It was absolutely a glut. At the peak in March 2016 there was 1,014 billion–over 1 TRILLION–cubic feet more natural gas in storage than there was a year earlier. Today that year-on-surplus is all the way down to a paltry 69 billion cubic feet…….and it is falling fast. To put that into perspective, the US uses about 70 billion cubic feet a day right now–so there is slightly less than one day’s worth of extra storage this year over last. Nobody would have imagined that inventories could fall this fast over the summer. It is what will come next that is going to make things really interesting. Last year the US had a very warm winter in the densely populated east coast. This year it is expected to be MUCH colder. And each really cold winter day can add 10 billion cubic feet of demand. One day, 10 billion cubic feet. Fact Two – Nobody is drilling for natural gas anymore. There are 92 rigs drilling for natural gas in the United States right now. That is down 94% from its peak and down 50% from just a year ago. Everyone has bought into the idea that the country is going to be flooded with natural gas for decades to come. But guess what…..if we aren’t drilling wells the production just isn’t going to be there. We are going to need natural gas production and it isn’t going to be available. The market is going to need to do what markets do. It is going to provide producers with a shocking price response in order to motivate them to drill. The rapidly vanishing inventory surplus tells us that supply growth is rolling over. Our problem is that the production decline can’t be turned around with the flip of a switch. When the Market figures this out investors and consumers will get a reminder of how volatile this commodity can be. It has been a while since we have had such a reminder, but when the market suddenly gets tight it’s a commodity that can double, triple or more within months. 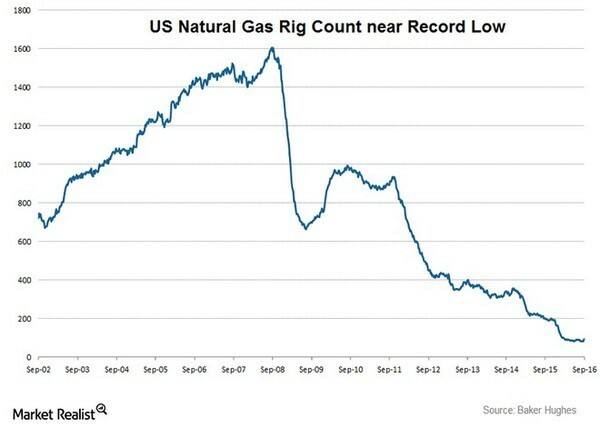 Right now, natural gas producers are in a lot of trouble from the last few years of very low prices. A countless number of mid and small cap natural gas producers have gone out of business during this downturn. Even the big natural gas producers like Chesapeake Energy (CHK-NYSE) and Southwestern (SWN-NYSE) are so weighed down by debt that they only focused on survival. Any extra cash flow these companies get from higher natural gas prices will help repair their balance sheets…not grow production. That’s why natural gas production will respond very slowly when the commodity price jumps. As an investor you can smell that fact that there is a rare short term opportunity to profit here. You’ve got your head wrapped around something the market hasn’t…that natural gas production can’t turn on a dime. That is what good investors do. While everyone else has their heads turned around looking at what has happened we are using our brains and figuring out what is going to happen. Investment decisions are made by looking through the windshield….not in the rearview mirror. So how do investors take advantage of this opportunity? It’s NOT by owning a company like a Chesapeake or Southwestern that is handcuffed by debt. That is risky and not what a good investor does. Now is the time to be selective, to really take advantage of what is about to happen. We are going to want to buy the best natural gas producer to profit from this. You owe it to yourself to make the effort to find the absolute best opportunity possible. I make my business out of finding these opportunities and I’ve got the perfect natural gas producer to own right now. Tell me if this is what you think an exceptional opportunity might look like…. Low debt, rapid growth, lowest cost play and a great management team. This company is a good investment at low natural gas prices and an incredible business at higher natural gas prices. The good news for you is that you don’t have to take my word on this. You can take look for yourself because I’m going to give you free access to my full report on this company. 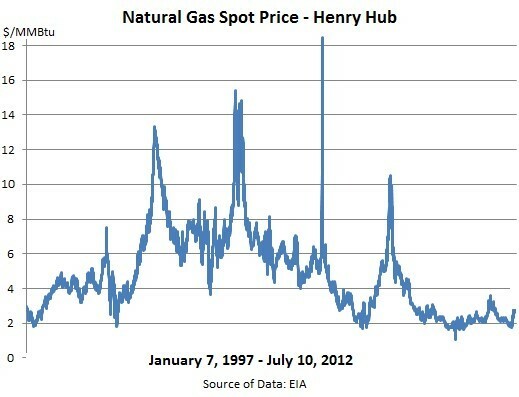 This is the way I personally am playing what it about to happen to natural gas prices. Don’t sit on your hands and let a very rare chance to get on the right side of a rapid commodity price move pass you by. And please don’t waste the opportunity by owning a mediocre company. All you have to do is…CLICK HERE..to read my report–RISK FREE–on this incredible natgas stock.